It's my first year blogging! It's my YouTube channel & Blog's 1st birthday. I started my YouTube channel June 8, 2011. That was also the same day I came up with the name for this blog. So, to celebrate the special day, I decided to film a birthday nail art tutorial for you all. It's not only my site's birthday, anyway. I have tons of friends celebrating their birthdays in June and I'm sure there are also many readers whose birthday is in this month, too. Cupcake, Gifts with a pretty bow, Party Hats & Confetti. How much more could we symbolize 'celebration' than those things? So I used those to create a cute nail art. I also used cute rhinestones as accent to the design. This step, however, is optional. Some of you may not be able to find rhinestones so I say just go ahead and skip this part. I got them from a local craft store here in the Philippines for only Php89 or $2. People outside the PH can buy them here. I love the colors of this design. I also love the cupcake. It looks so yummy. Too bad it isn't edible. 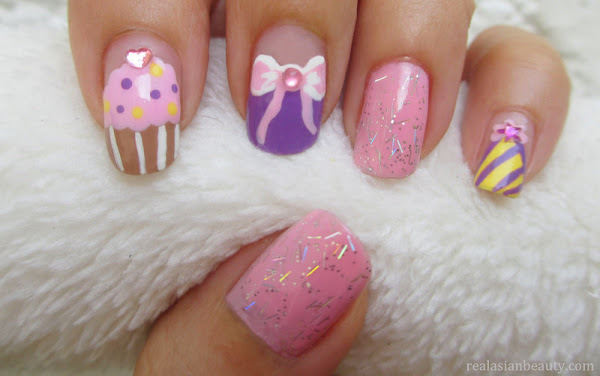 I'm sure a cupcake that looks like this in real life would be totally delicious! Check out my YouTube channel if you haven't yet.